The Samsung NP700Z5A is so sharp, it hurts. I researched the Samsung Series 7 Chronos for several days, reading glowing review after glowing review. Not one mentioned the wrist rest edge is literally sharp enough to hurt. Either the reviewers all have very small hands, or they completely overlooked this awful design flaw. While the Series 7 is a thing of beauty closed, while open & in use, it’s torture. The wrist rest is so sharp, it literally makes a scratching noise against skin & leaves white scrape marks. 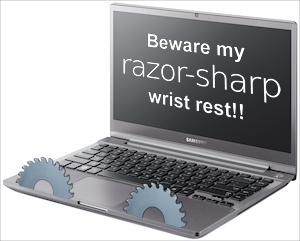 The problem is Samsung put the wrist rest surface inside the outer case (which is metal), so the sharp edge of the outer case sticks up slightly & its unbeveled metal edge digs into your wrist. Not nice. Another significant usability flaw is the ELAN touchpad. With the default settings, scrolling a page is jumpy & the motion actually reverses direction every few seconds. Also since the pad is so huge, it’s hard not to touch the edges inadvertently when typing & ELAN’s palm filtering isn’t nearly as good as Synaptics’ touchpads. Eventually I was able to improve things by lowering the sensitivity to the 3rd-lowest level. To add insult to injury, the touchpad buttons usually stop responding after resuming from sleep mode. Yet another flaw is the wifi range. This issue actually was mentioned in most other reviews, so I won’t go into detail other than to say I get one bar with the Series 7 where I get 4 bars with our other laptops. To watch streaming HD video, I have to be in the same room as our 802.11n wifi router. My last gripe is with Samsung’s screen auto-dimming feature. It uses an ambient light sensor to adjust the screen brightness. However the Series 7 does it in very sudden & noticeable steps, in immediate response to every little change in ambient light. If you’re working near a window on a partly sunny day, or have an overhead light behind you & don’t keep perfectly still, the auto-dimming feature on the Series 7 goes bezerk trying to adjust. Luckily you can disable the feature entirely. The touchpad & auto-dimming could be fixed with software updates, but the knife-edge wrist rest is just plain stupid. For now, the horrid usability issues ruin what would otherwise be a very nice laptop. UPDATE: Okay, another gripe — I’ve also been getting a Blue Screen Of Death (BSOD) caused by asmtxhci.sys when resuming from sleep mode, whenever I have my iPhone plugged in to one of the USB 3.0 ports. The asmtxhci.sys file is the USB 3.0 host driver from ASMedia Technologies, Inc. The BSOD happens often enough to be a nuisance. Once again, hopefully a software patch will fix it. For now, it’s yet another problem that doesn’t improve my opinion of the Series 7 Chronos. Using the USB 2.0 slot for my iPhone seems to work around the problem. The Samsung SE-506AB Blu-ray burner includes ancient CyberLink software that's no longer supported & may not play some Blu-ray discs. Initially I thought the Samsung SE-506AB unit I bought was defective — it would not play Blu-ray discs. I had purchased it along with a Samsung Series 7 Chronos laptop. The Samsung Blu-ray burner comes with CyberLink PowerDVD 9. The Samsung laptop came with CyberLink MediaSuite, with a free download upgrade to PowerDVD 10. I assumed v10 was better than v9. Wrong. PowerDVD 10 kept insisting “There is a a disc with an unsupported format in drive X:”. I finally noticed an asterisk in CyberLink’s help file with a footnote that not all versions of PowerDVD 10 support BD playback … apparently, the free upgrade offered through Samsung was the DVD-only version. CyberLink needs to make that more obvious, like perhaps mentioning it in their troubleshooting FAQ??! Samsung began shipping the SE-506AB Blu-ray burner in September 2011. PowerDVD 10 was released in March 2010. Plenty of time for Samsung to have included it. PowerDVD 9 was released way back in March 2009. 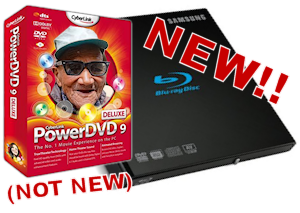 In other words, PowerDVD 9 was already 1 ½ years out of date when the Samsung SE-506AB began shipping. So why is Samsung shipping a brand new Blu-ray burner with vastly outdated software? Taking cost-cutting to the extreme, perhaps? That’s fine, until you start to tick off your customers.